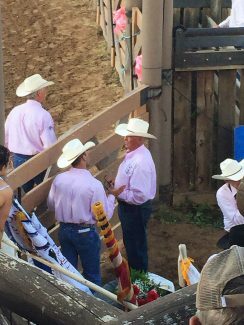 Pat Roberts (right) has done nearly every job to be done in the arena at the Deadwood, S.D. rodeo. When he was four days old, Pat Roberts went to his first Days of '76 Rodeo in Deadwood, S.D. And he's never missed a performance since then. In his 62 years, Roberts has attended every single performance of the Days of '76, which figures out to about 215 nights of rodeo. He's not the first in his family to be involved with the rodeo. Pat's granddad and his namesake, Pat helped drive the bucking horses to town in 1924, the rodeo's first year, and for years after. 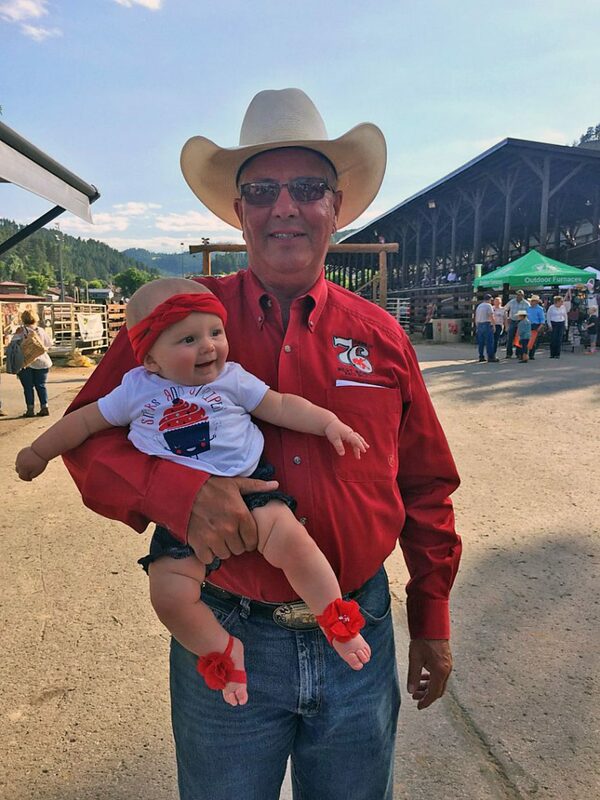 Pat's dad, Bub, was a long-time volunteer and served as rodeo chairman in 1974, and four days after his birth on July 28, 1955, Pat's mom, Wanda, bundled him up and took him to the rodeo. His jobs at the rodeo have included everything from the dirt to the livestock. As a teenager, he stood beside a judge with a chalkboard, writing down the roughstock scores and flashing them at the crow's nest so the announcer could read them. He's pulled the barrier, sorted timed event cattle, worked the dirt with a tractor, set up temporary panels, hung banners, untied calves and steers, served as rodeo chair three times (1993, 2002 and 2017), and worked countless hours. He loves it all, or at least most of it. The only job that isn't his favorite is setting up and tearing down the temporary pens the committee provides for the horses, bulls, steers and calves. Space around the rodeo arena is limited and includes football, soccer and baseball fields and a museum and there is no room for permanent pens. Roberts has no favorite part of the rodeo; it's all his favorite. "Every aspect of rodeo, I like. Even untying calves and steers," he said, although that's a job he hasn't done in years. If he were to do it now, "I wouldn't be getting up in the morning." He dated his wife, Annie, for two weeks when he introduced her to his favorite pastime. He was working a Little Britches Rodeo in town, and since then, she's joined him at the rodeo. She volunteers, and as their children, Michael, Chris, Scott and Abby came along, they joined their parents at the rodeo. Chris, their second son, is following in his dad's footsteps. Born on June 14, 1982, he was at his first rodeo when he was three weeks old, and he's never missed one, either. He serves on the executive committee for the rodeo. The couple's other three children: Michael (the oldest), Scott and Abby, volunteer when their work and family schedules allow it. Now the fifth generation of the Roberts family is volunteering. Michael's daughter, Katie, helps Papa and Nana at the rodeo, sorting steers and calves. The fifteen year old lives in Sturgis, and "she just loves it," Pat said. "It's in your blood, it really is." The Days of '76 rodeo has won the PRCA Award for Rodeo of the Year 17 times. In the early 2000s, the award was divided into two categories: small and large rodeo, and Deadwood won it four times as a small rodeo. In 2004, a third category was added: medium rodeo, and the Days of '76 has been the sole recipient of that award for 14 consecutive years. What's the magic for the Days of '76? Roberts believes it's a variety of things. The scenery is "incredible," he said, at the rodeo arena, and the committee works hard to make a good rodeo for contestants. "We put up enough money, and we have the best stock in the world, and when you get the best stock, you get the best cowboys. That's the magic of Deadwood. (The cowboys) love to come to Deadwood." 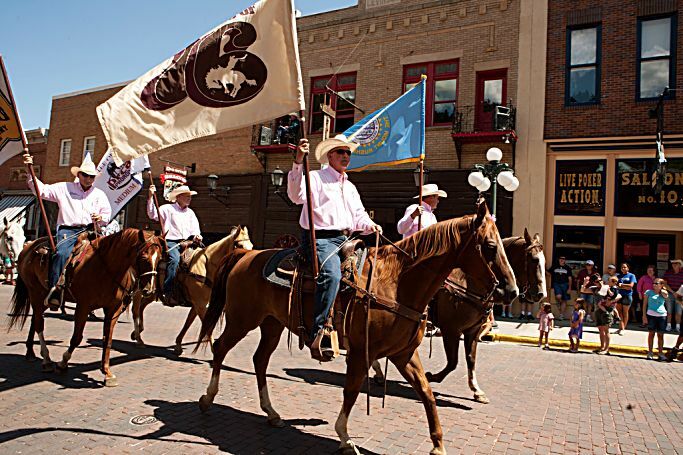 In addition to the five performances for the Days of '76 in late July, the committee produces and hosts the Badlands Circuit Finals Steer Roping and a two-day stand-alone steer roping, both in August. Rodeo has changed in 62 years. Years ago, the Northern Hill Community Band provided the music, sitting in a section of the grandstands and striking up a tune each time a contestant would come out of the chute or the timed event box. Now, the rodeo employs a music director who plays popular songs over the sound system. And cowboys used to stay for the entire length of the rodeo. Roberts remembers cowboys relaxing after the rodeo, "sitting on hay bales, with the likes of Chris LeDoux, who'd be in Deadwood for three days, and we'd have some beer, sing along and have a great old time." Now contestants get to the rodeo, compete, and leave for the next one. "These guys are in and out. They travel, do their job, and they're at another rodeo the next day." Roberts, his willingness to work and his loyalty to the Days of '76 are an "inspiration" to his fellow committee members, said Greg Nelson, who's been on the committee for 25 years. "He shows up on work nights, he helps set up panels and tear them down, just like everybody else. He's a great guy to have on the committee, to work next to. "He believes in the committee, and it's in his blood. As far as the Days of '76 goes, he's all about it, and whatever he can do to make the rodeo better. You don't stick with an organization for fifty years, if you don't believe in it and if it's not a good organization." Roberts lives for the rodeo. "I love it," he said. "I love the Days of '76, the town, the support. I wouldn't even dream of doing anything else.